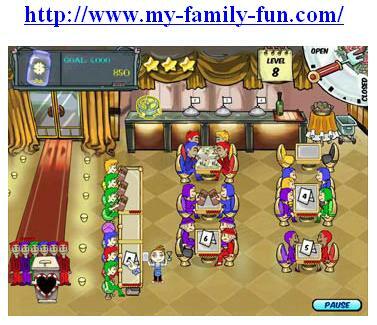 My Family Fun - Diner Dash Create your five star restaurant! Create your five star restaurant! Welcome to Diner Dash, the action-puzzle that brings out the entrepreneur in all of us! Poor Flo! Sick and tired of pushing paper in the dreary, bleary-eyed world of finance, she ditched her desk job and now she's rolling up her sleeves and setting out to build her very own empire of high-class, five-star restaurants. It won't be easy, though! Flo's on her own now, and heading for the top! To get there she'll have to start on the ground floor—and she needs your help to survive and thrive. 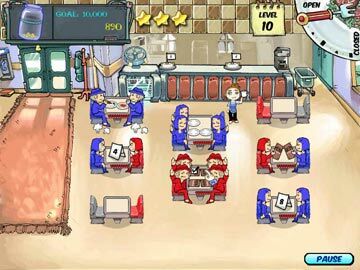 Diner Dash blends the best in fast paced-action puzzles with a build-your-restaurant-empire theme that encourages players to serve their way from a two-table diner to the top of the restaurant ladder – starting with a run-of-the-mill greasy spoon and ending in a dream restaurant that will take your breath away! 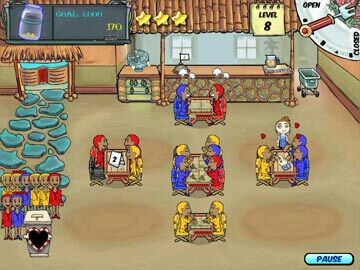 40+ challenging levels of addictive, skill-based game play that allows you to grow your restaurant through 4 complete re-models. 5 different types of customers, each with different behaviors. 2 modes of play, Career, and Endless Shift. Fun sounds, cool visual style, flashy effects, and humorous animations. High score tracking and automatic game save.